The Alpha-Tubulin acetyl-K40 kit is designed for the rapid detection of K40 tubulin acetylation in cell lysates. Alpha-Tubulin is a member of the tubulin protein superfamily, which polymerizes with the beta tubulin to form microtubules, a major component of the eukaryotic cytoskeleton. Microtubules contribute to several cellular processes, such as structural support, intracellular transport, and DNA segregation. Alpha-Tubulin K40 acetylation has been shown to affect tubulin self-assembly and protect microtubules against stress-induced material fatigue. 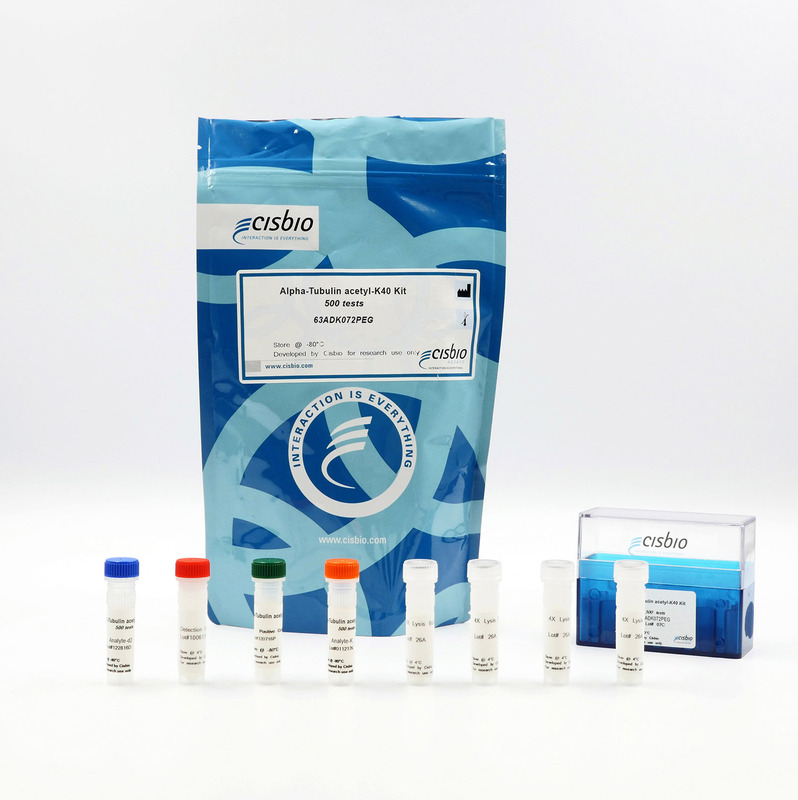 The Alpha-Tubulin acetyl-K40 kit is designed for the quantitative detection of K40 acetylated Alpha-Tubulin in cell lysates. Alpha-Tubulin acetyl-K40 is measured using a sandwich immunoassay involving two specific anti-alpha-Tubulin antibodies, respectively labelled with Europium Cryptate (donor) and d2 (acceptor). The intensity of the signal is proportional to the concentration of K40 acetylated alpha-Tubulin present in the sample. The protocol for the alpha-Tubulin acetyl-K40 assay is described here. Cells are plated, stimulated, and lysed in the same 96-well culture plate. Lysates are then transferred to the assay plate for the detection of Alpha-Tubulin by HTRF reagents. This protocol enables the cells' viability and confluence to be monitored. The antibodies labelled with HTRF fluorophores may be pre-mixed and added in a single dispensing step to further streamline the assay procedure. The assay detection can be run in 96- to 384-well plates by simply resizing each addition volume proportionally.